Free TracFone airtime codes get you extra talk time on your phone. There are lots of places online where you can find codes to save money with your TracFone. The easiest way to get free airtime codes is when you first sign up for your new phone because there are many TracFone promotions available. Not all special offers are reserved for new customers though. You can find codes for bonus minutes online. The codes do require that you purchase minutes to get free minutes so you will still need to spend some money. Are There Truly Free Ringtones for TracFones? Another way to get a code is to set up an account on TracFone.com. You can enter an email address to receive promotions, including codes for free minutes. These offers provide mailing list members with great deals and savings. Some websites may require you to purchase and activate a new phone, but the additional minutes are free. Others attach bonus minutes to your purchase of airtime minutes for your phone. If you are using a code you found online, be sure to check the dates the codes were posted since codes do expire. Many codes are listed on this site including offers such as get 60 minutes free with the purchase 60 or 120 minutes. There are also discounts on cards for data, such as $15 for 500 MB. If you're looking to buy a phone bundled with minutes, there are promo codes for that as well. Coupon Box offers free airtime codes that are paired with the purchase of minutes. For example, you can get 30 minutes free if you purchase 120 minutes. New codes are updated often, and you can also see types of codes that have been offered that are now expired. If you sign up for their newsletter, you can get notices when new codes are added. Coupon Cabin lists codes for phone sales and for free minutes. They also list expiring codes. You can sort codes by newest, popularity, and expiring soon. Discounts for both phone purchases and minutes are available on Coupon Chief. An example of a coupon code is 20 free minutes if you purchase a 60-minute card, or 30 minutes for free. Users of the site can also upload codes they have found for others to use. Daddy-O Deals is a forum that allows users to post the free codes they come across. The forums are not very active, so your best bet are the coupon code sites. Promo Code for All has codes that are updated monthly. They claim to list almost 100 promo codes regularly, and these cover free minutes and phone sales. Codes at Retail Me Not are updated frequently, and you can get feedback on which work best. There are both phone purchase and free minutes with minute purchases on the site. You'll find more bonus coupon codes for TracFones at Save on Prepaid Phones. You will also see success rates, so you'll know if a code hasn't been working well without having to spend time trying it yourself. TracFone Reviewer lists updated codes monthly. Like other sites, the codes are for the purchase of minutes plus a certain number of free minutes. The codes are compiled in a simple list, which makes them easy to find. There are new codes added monthly to the Valpak site. In addition to discounts on free codes purchased with minutes, they also offer discounts on orders of the phones. Consider the following when you use TracFone codes. You will either need to visit the TracFone website to enter your codes or add them directly into your TracFone. 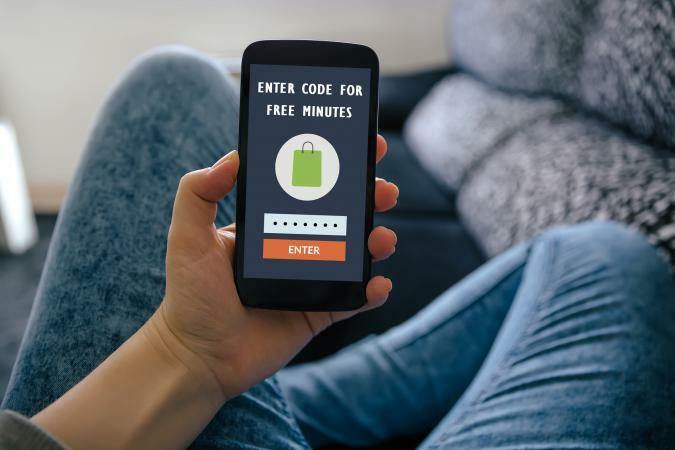 The danger of adding codes directly to your phone is if the code is invalid, you may end up having purchased minutes without a free benefit. Another issue is the codes are not always safe to use, so the best way to add them is via the website. You may need to try several codes until you find the one that works for your plan and phone. You also can call TracFone and have the codes added over the phone. When entering a code or adding minutes to your phone, it is important to have your TracFone turned on. While minutes may be added instantly, it can also take up to 24 hours for a promotional code to be added to your phone. There are plenty of free airtime codes available for TracFones, whether you're setting up a new account or just loading more minutes on your phone. Be sure to do a quick search before adding airtime so that you can get the best deal possible, paying less overall per minute.